The 2013 NAMM (National Association Of Music Merchants) convention took place in Anaheim California between Thursday, January 24th and Sunday, January 27th. Despite throngs of inebriated metal heads roaming the Anaheim streets, instrument booths in the convention hall, and thousands of music merchants packed into the Anaheim Convention center like sardines, there were several stellar musical performances by some legendary names and innovators in the music industry, especially in the jazz and blues categories. On Friday night, Hammond Organ presented its two-plus hour “Hammond Soul Summit” Concert at The Anaheim Marriot, which featured some of the instrument’s greatest and most influential practitioners. 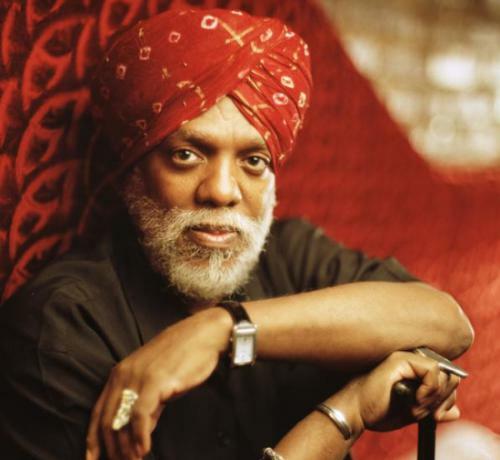 Kicking off the show was the legendary jazz and funk Hammond B3 pioneer, Dr. Lonnie Smith performing with the incredible Chester Thompson (Tower Of Power and Santana) and Larry Goldings (Al Jarreau, Maceo Parker, John Mayer). 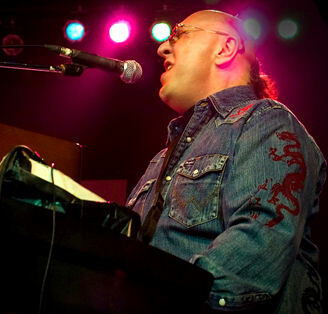 The three organ titans performed a loose and funky rendition of Smith’s classic “Keep Talkin’.” Backed by a dynamic rhythm section (Jay Didimo on drums and Jack Maher on electric guitar), Smith and Thompson began swapping bluesy organ licks, trying to upstage one another, pushing the exchanges to ecstatic heights. The energy was electric and took the predominately rock loving NAMM audience back to school. 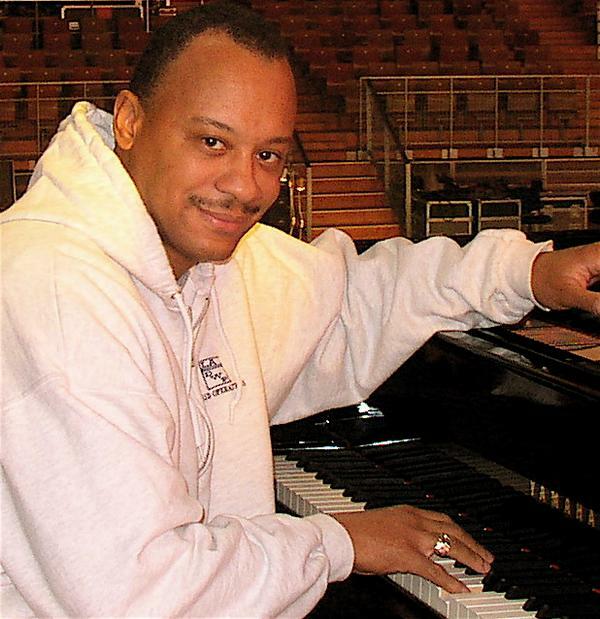 Goldings soloed on an acoustic piano preset on his electric keyboard, playing jazz-fueled gospel chops while Thompson and Smith comped rhythm changes and walking organ bass lines behind him. Unfortunately, they were only allotted time to play one number. Though it was hard for Tuffano to come close to topping Grebb’s soulful, Ray Charles- inspired vocals, he proved to still have the fire. This was the most nostalgic and exciting moment of the convention. Goren played some tasteful B.B. King style licks with the maturity of a musician 3 times his age, proving that he’s definitely someone to watch out for. Larry Goldings returned to the stage with his trio (Jack Maher: guitar, Jay Didimo: drums), performing a brilliantly original arrangement of the Sonny Rollins classic “Doxy.” Golding’s imagination, fluidity, and inspiring skills incorporated many of Rollins’ saxophone lines in his organ solo and made it look easy. Although many hard-rock acts dominated the main stage throughout the convention, Nick Smith And Friends performed a set of pure jazz at 4:00pm on Saturday. Tonight Show keyboardist Smith was joined by an all-star band consisting of Marvin “Smitty” Smith: drums, Cory Jacobs: keyboard, Trevor Ware: Upright bass, James Manning: Electric bass, Antonio Julius: trumpet, Ray Fuller: guitar, and Kamasi Washington on tenor sax. Performing a set of hard-bop originals such as “Alternative Way,” “Slow But Surely” (a masterful tribute to Thelonious Monk), and “Tony Williams” (a salute to jazz drum legend Tony Williams), Nick Smith And Friends proved to be one of the most consistently brilliant jazz bands around today. 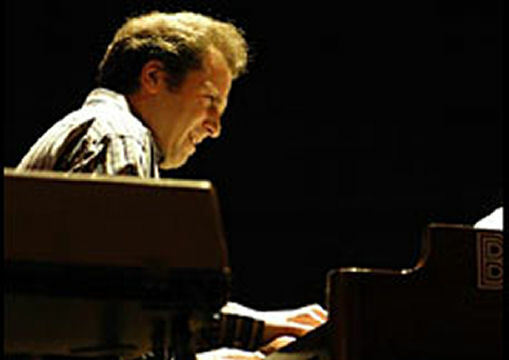 Amazingly (believe it or not), Nick Smith played with the syncopation and humor of Monk and virtuosic energy and fluidity of McCoy Tyner in what I can already predict will be among my top ten performances of 2013. Marvin “Smitty” Smith’s bombastic drumming pushed the entire band to play beyond their comfort zone, which is what true improvised jazz is all about. And Kamasi Washington’s playing brought to mind the adventurous spirit of a young Wayne Shorter or mid-60s Joe Henderson. Even the band’s final tune, “Yeah” (which was a slight venture into funk/fusion) felt fresh and fun without the typical clichés of those genres. Nick Smith And Friends’ too short set was filled with an understanding and love of the history of hard-bop, modal jazz, with just a hint of fusion. Later that evening Muriel Anderson’s “All Star Guitar Night” was presented by Yamaha guitars, and a benefit and silent auction for The Music For Life Alliance took place at The Anaheim Marriot’s Platinum Ballroom. Though the big name acts like Stanley Jordan, Robben Ford (who received The Guitar Player Certified Legend award at the event) and host and performer Muriel Anderson were the big name draws of this “exclusive” event, it was some of the lesser known names who were the most interesting of the long showcase. 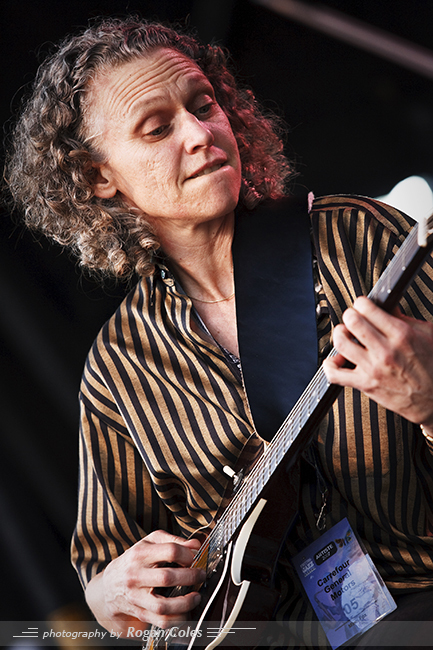 Jazz guitarist Mimi Fox performed elegant and thoughtful versions of Wes Montgomery’s “Four By Six” and Chic Corea’s “Five Hundred Miles High,” using open harmonics and sweeping arpeggios, all while playing lead and rhythm simultaneously. It was easy to see why Fox has been sought after by Stevie Wonder, Diana Krall, and Branford Marsalis, among others. Ian Ethan Case is a young guitarist with a style that is both sonically and visually original and unorthodox in all the best ways. Case’s performance at this showcase surely had many six-stringers rethink the possibilities of the guitar. 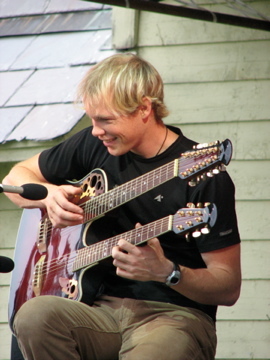 Case plays a double neck acoustic guitar in a unique and percussive manner, strumming the six string side of the guitar with one hand, while fretting chords and lead sequences on the 12 string side with the other hand, over the neck of the guitar while occasionally thumping his fists on the instrument’s body, creating polyrhythms. One must see this to believe it. His ideas were endless, playing a style that had elements of country, acoustic rock, and bluegrass, but is a completely unique sound nonetheless. Case’s ballad “Anthony’s Lullaby”, dedicated to his infant son, had a dream-like, dissonant yet dark, melodic quality to it. It was refreshing to witness a guitarist who has created his own style and is not emulating a host of other players. Vocalist Toots Hibbert and guitarist Carl Harvey are know for their work in the prolific reggae band Toots And The Maytals, but their acoustic, Delta Blues renditions of the Maytals’ classics “Reggae Got Soul” and “54-46 Was My Number” was a brilliant departure for these two men from the reggae world. As both men strummed acoustic guitars, with Harvy playing an occasional piercing lead, Hibbert’s vocals sounded like a cross between the late Reverend Gary Davis and Richie Havens. Their country blues arrangements gave the songs new fire and soul. This was pure blues without any of the affectations that many guitarists of other genres who try to conquer the blues are often guilty of falling back on. Ukulele master James Hill and bassist Bakithi Kumalo (bassist on Paul Simon’s Graceland album) brought some much needed humor to this event, performing a witty reading of Michael Jackson’s “Billy Jean,” with Hill singing and playing the chord changes on ukulele and Kumalo playing the funky bass line on a small, short scale bass. 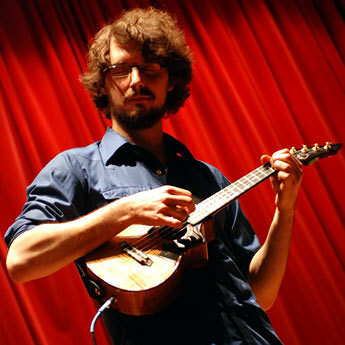 The sound of Hill playing those syncopated minor ninth chords on a ukulele made his performance one to remember for a long time. Although Hill is a skilled musician, it’s rare and refreshing to see an artist at an event like this who doesn’t take himself too seriously and isn’t afraid to show it. So that’s it for my NAMM 2013 highlights. At a huge event like this, it’s quality over quantity as there were hundreds of performances during the four day convention. Like most of the NAMM attendees, I’m exhausted yet already curious about next year’s lineup of showcases and events. Previous Post Live Music: Alfredo Rodriguez at Vibrato Grill Jazz…etc.